"Dressing the Saints: Catholic-related Maya Textiles for the Santos/as," by Elizabeth J. Caris. Figure 1a. This late 19th century painted wooden santo would have been fully dressed in fine miniature Maya textiles and processed through the community on festival days. Michael C. Carlos Museum, 2009.42.260. Photo by Michael McKelvey, 2017. Figure 1b. Detail of Michael C. Carlos Museum, 2009.42.260. Photo by Michael McKelvey, 2017. As explored in this exhibition and catalogue, textiles permeate all aspects of life throughout the Americas, proving to be an effective tool for understanding societies and the ways in which they change over time. In particular, textile-oriented cultural expression endures from the ancient to the colonial and modern eras in the Maya-dominated region that corresponds with modern Guatemala. Yet, unlike textiles preserved in the arid desert climate of the Andes, very few ancient textile remains have been found in moister Mesoamerican region, driving art historians to study dress and weaving largely through other media, such as sculpture and painting (see The Ties that Bind). In post-Hispanic times, however, significant scholarship on modern Maya dress has revealed both continuity and change in Maya textiles, particularly in the Guatemalan highlands (e.g., Berlo 1991, 438; Holsbeke 2003, 22). The many iterations of modern Maya textiles include not only men’s and women’s clothing (see Creations of the Red Goddess), but also special cloths reserved for indigenous ritual use (figs. 3-5) and others involved in Spanish-influenced Catholic ritual via the cult of the saints (figs. 1, 6, 8-12). This essay will introduce how both Catholicism and syncretism — the mediation of Maya beliefs and the imposed European religion —figure in dressing the saint figures (santo for a male, santa for a female). Since colonial times these carved wooden effigies used in ostensibly Catholic worship by the Maya have been elaborately dressed and re-dressed, as well as prayed to, paraded, and honored in myriad ways that walk a thin line between indigenous and Spanish practices. Such finely outfitted effigies function as intermediaries between the human and the spirit realms as well as bridges between the two religious-cultural contexts in which they simultaneously operate. The use of similar-looking cloths for clearly shamanic purposes, sometimes used within the Catholic church building itself, stands as a testament to the intertwining of Maya and non-Maya ritual systems. Certain key elements of Maya Catholicism can be gleaned from miniature santo jackets, shirts, belts, and capes (figs. 6, 8-11), santa huipiles or blouses (fig. 12), as well as the offering cloths arrayed around them (fig. 10). From the continuing use of traditional patterns and techniques to the incorporation of Catholic symbolism to deliberate subversion of the dominant foreign culture, Maya santo/a-related textiles help trace key changes in history, tradition, expression, and representation. Shamanic cloths (fig. 3) may masquerade as simple all-purpose cloths, but their uses illuminate the intermingling of cultures and ideas that pervades the post-Hispanic indigenous world. The parallel uses of santo-related clothing and offerings and similar-looking cloths employed in shamanic ritual and Catholic contexts forms not only a case study in syncretism, but also one in the preservation of indigenous identity. As such, the dialectic between the two major forms of religious textiles is a dialogue between tradition and change, conducted in fiber. Figure 2. 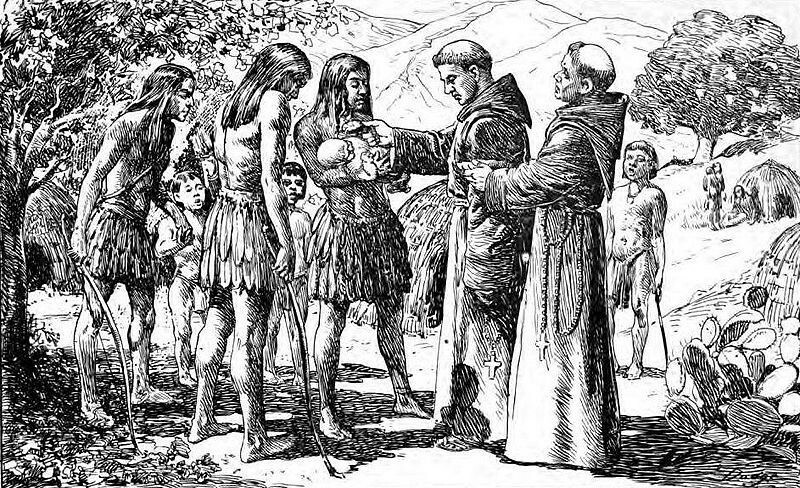 Friars from the Catholic orders attempted to quickly baptize as many indigenous peoples of the Americas as possible. This sketch records the first baptism in Alta California. Image licensed under Public Domain. The history of Catholic intervention, particularly the cult of the saints, must first be briefly introduced. Outlasting nearly any other vestige of Spanish colonization, Catholicism may be considered the primary heritage of Spain in the Americas (Van Oss 1986, xi). Religious conversion was one of the highest priorities for the invading and colonizing Spanish, across their incursions into the Americas. During the colonial period, they sent to the Americas more than fifteen thousand missionaries and friars of the Catholic orders. Approximately six percent were assigned to Guatemala; the only greater numbers were sent to cover the much larger viceroyalties of Mexico, Peru, and New Granada (which spanned what are now Colombia, Ecuador, Panama, and Venezuela) (ibid., 6). In an effort to complete the conversion process peacefully, a goal of the Spanish, it cannot be surprising that elements of indigenous spiritual beliefs were incorporated and utilized within the Catholic belief system. Achieving as peaceful a conversion as possible of such a great number of people required that a certain degree of accommodation, albeit reluctant, be extended to indigenous traditions (ibid., 14-20). First, converting the indigenous populations of Guatemala meant transporting the indigenous people scattered throughout the highlands into centralized settlements more like those the Europeans had known. These newly resettled congregaciones mirrored Spanish-style towns, centered around a community church. The daunting task of creating them was left to the Spanish friars of the religious orders. However, mass conversion, difficult though it was, was much preferred to large-scale, complex military endeavors by Spain. In an effort to keep the conversion as smooth as possible, the shrewd friars relief on the practice of gift-giving to gain the confidence of the indigenous Maya leaders called caciques. Showering the local leaders with Castilian products, such as scissors and needles, gave the missionaries a distinct advantage in their efforts to first baptize the elites and then follow with the rest of the population (the same type of strategy was used with the Guna people, see Engaging the New). This mass conversion was relatively pacific as a result, but by no means quickly achieved. Figure 3. 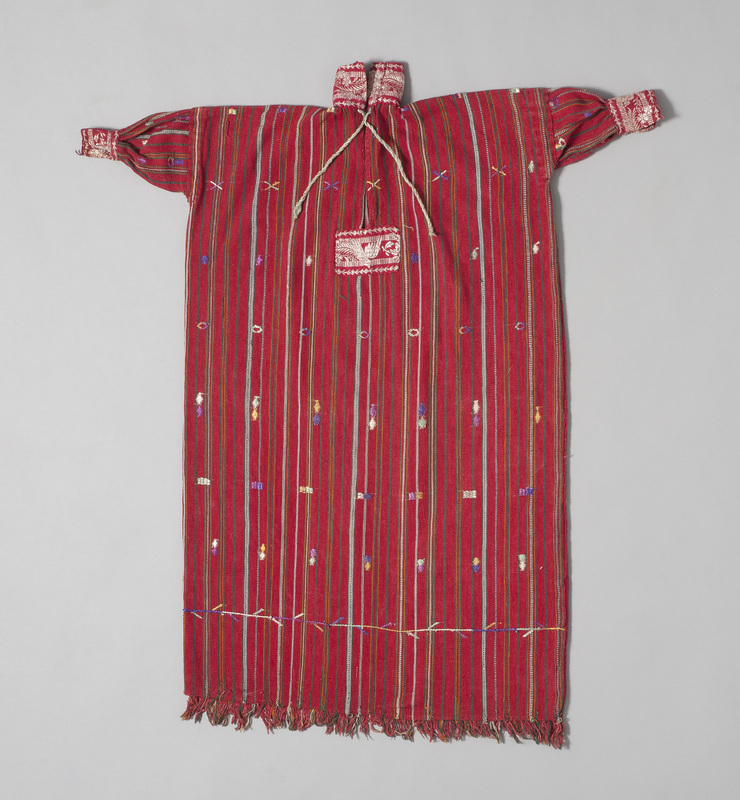 This pisbah kotsih from Nahualá is an excellent example of shamanic bundle cloths surreptitiously used in Catholic settings. Michael C. Carlos Museum, 2009.42.69. Photo by Michael McKelvey, 2017. Confraternities, or cofradías, generated by the Spanish, are perhaps the best example of syncretism between indigenous Maya practices and Catholic structure. Cofradías are a kind of religious brotherhood, initially only institutionalized in urban areas by the Spanish. Similar institutions existed in Spain, though those in the Americas differed due to the racial divide they encoded between Spaniards and “Indians.” The confraternities were tasked with overseeing the worship of the saints, particularly that of the cult of the community’s patron saint. Many towns had (and continue to have) multiple cofradías, each responsible for a different saint and its cult. Deeply hierarchical, the societies consisted of ranked offices with opportunities for advancement for those “indios” who provided commendable service. Members would regularly meet to venerate their saint at its shrine, which was located in the homes of confraternity members. Often the highest-ranking member hosted the gatherings and directed the activities (Christenson 2016, 153-154). Catholic accommodations to Maya culture were especially visible in the Church’s relationship with the cofradías. Confraternities were expected to generate revenue from the indigenous population and in turn make payments to the Church. These cofradía payments paid for church services, priests, and saints’ day festivities, making them the primary source of clerical income, which prevented the Church from aggressively regulating their activities. In 1770, an archbishop in Guatemala wrote that the suppression of the local cofradía system in Sololá had led to the local Kakchiquel Maya to abandon the Church and refuse baptism. He concluded that because of this and other such incidents, the Church would run the risk of mass exodus and even large-scale revolts by the Maya, and urged the Church to abstain from manipulating the confraternity systems (ibid., 188). Though less prevalent than in the Colonial period, cofradías persist today, and are still concerned with the maintenance of their saint figures. The saint images continue to be processed through the community on sacred festival days. High status achieved by rising through confraternity ranks remains a critical mark of community respect, and cofradía officials spend much of their own money to mount elaborate displays of veneration. Additionally, the most elaborate Maya clothing seen since the Conquest is often those worn by members, as the confraternities are closely tied to status and rank in addition to religious activity (Altman and West 1992, 18). By 1787 there were 3,153 authorized cofradías in Guatemala. Not surprisingly, the overwhelming Maya response to the system elated the Spanish. However, when the Church began to look more closely at the local confraternities, it was evident that they were being used largely to perpetuate pre-Conquest tradition, ceremony, and beliefs (Christenson 2016, 188). Despite the Spanish intent that the system more readily facilitate Catholic conversion, the cofradías became a primary setting for the continued expression of local traditions and exemplified a syncretic religious system rather than a purely Catholic one. Local traditions are clearly shamanic in nature and have been for thousands of years in Mayaland (Schele, Friedel, and Parker 1993, 11-13). In such a system, the curing of ills — be they physical, natural, or social — is the responsibility of a spiritual intermediary who contacts the other realms of consciousness via ceremonies and often in trance or trance-like states (see Stone 2011). Ancient Maya shamans, similar to contemporary ritual specialists found throughout the indigenous Americas, often utilized entheogenic substances to reach altered states of consciousness in order to cure, divine, or communicate with the spiritual realm. They also presided over ceremonies to ensure “life, health, and sustenance” for their community (Sharer 2006, 745-747). During those rituals, special cloths are employed to bundle, carry, and present power objects when placed on the earth, with them the shaman can carry on his/her intercessory spiritual duties on behalf of the community. Figure 4. 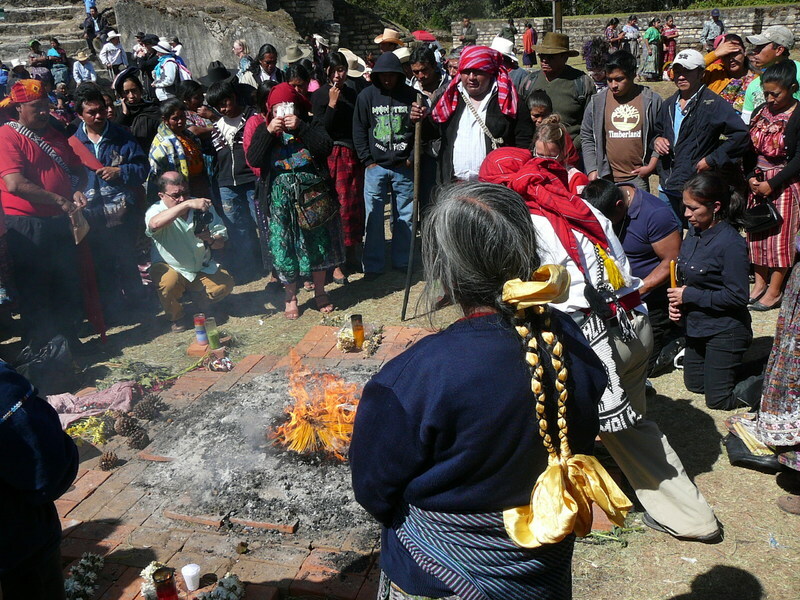 In this outdoor Maya ceremony at Iximche, a red and white textile is filled with offerings (to the left of the fire). Photo by Tom Fortunato, licensed under CC BY 2.0. The shamanic bundle cloth, known as a pisbal kotsih (fig. 3), interestingly enough, is not well differentiated in the literature on Maya fiber arts, nor does it appear in descriptions in appraisals, catalogues, and so on. The designation pisbal kotsih appears in a 1940 account of Chichicastenango textiles in the form of an illustration and short discussion of its uses (Rodas, Rodas, and Hawkins 1940, 131-134). 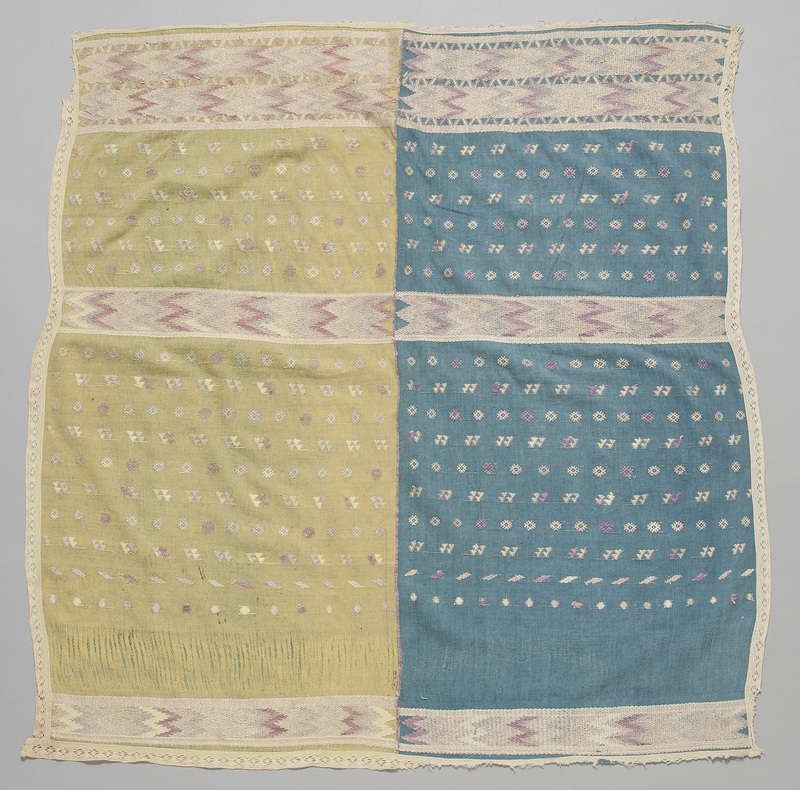 A very similar textile exists in the Carlos Museum collection, where it is generally designated a “cofradía servilleta” or “Catholic confraternity napkin” (so named for its napkin-like appearance rather than an indication of actual function). In the Carlos Museum accession records there was no mention of any shamanic or even non-Catholic function; the 1940 text clarified its identification. Clearly, sacred shaman’s bundle cloths do not differ visually from other types of typical Maya textiles: they combine striped backgrounds with brocaded elements, are comprised of two cloths sewn together with extravagant embroidery over the seam, and take a roughly square shape. However, according to the illustration and description in Rodas et al., the brocaded figures are proportionately larger in relation to the whole piece than in other types, all of them face upright in one direction, and the predominant background hues are the high-status reds and blues. It is significant to note that these pisbal kotsih are hidden in plain view, not generally acknowledged for their specific and almost entirely non-Catholic uses. 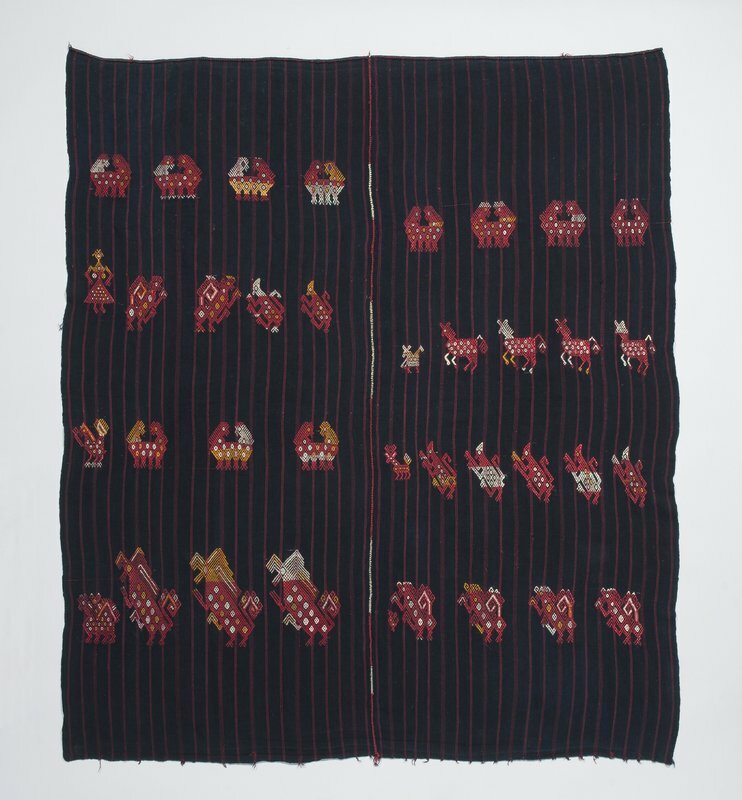 They have been able to move throughout communities and Western collections as largely indistinguishable from other textiles used for clothing and other purposes. Since the early 16th century shamanic religion has been vilified by the Spanish and, hiding Native practices from the new overlords allowed the Maya to survive over the last five hundred years. Yet a surprising proportion of the use of such decidedly non-Catholic cloths has taken place in the outdoor settings (fig. 4) in which shamanic ritual occurs and even inside Catholic churches themselves. Not only difficult to differentiate from other types (“it is indistinguishable from the ordinary kaperrah or “napkin” [Rodas et al. 1940, 131]), the sacred cloth’s name and the beliefs encoded in its uses were challenging to communicate in Western terms. The authors complained it was “very difficult to translate” what pisbal kotsih meant; however, in 1940 Rodas et al. were ahead of their time in even attempting to reconcile the relationship of two such starkly differing religious systems. They concluded that the most accurate translation was a “container for flowers or other offerings…for [the shaman’s] gods, ancestors, and saints” (ibid.). According to this description of the pisbal kotsih in use, the Catholic saints are among the spirits to which the shaman directs his attentions. Santos thus act as an intercessory power, much like the staple belief of shamanism that the shaman must rely on the intercessory power of supernatural beings to help humans on this plane of existence (Stone 2011, 62-65). Rodas et al. call the pisbal kotsih “the holder of prayer-containers” (1940, 131). The “holder” or cloth, is concerned with hiding, protecting, and revealing sacred entities (recalling the Andean concept of ukhu, see Dialogues in Thread). When the pisbal kotsih is carrying its offerings, there are multiple levels of containing and hiding. The cloth encloses the sacred offering material, which, in turn, contain the prayers the intercessor (shaman) wishes to convey to higher powers. The 1940 ethnographers admit that “it may seem absurd to describe objects such as candles as containing prayers, but to the mind of the Indian, more mystical and also more materialistic than we, such offerings do in a sense contain prayers, for he imagines prayers to be wafted upward, toward the gods or the ancestors, on the fumes of pom or the aroma of flowers” (ibid.). Figure 5. Festival days in Guatemala, such as this Santiago Saint’s Day Procession in Santiago Atitlán, include elaborate processions of fine dressed santos/as through the town. Photo by “majunznk”, licensed under CC BY-ND 2.0. The concept of offerings containing or transmitting prayers can also be found in Catholicism, especially in the use of candles lit in a specific chapel in front of a saint image and thought to reinforce the prayers of the supplicant. However, the Maya practice appears significantly more grounded in objects as vehicles and living entities than Catholicism allows. The objects inside the bundle cloth included flowers and European candles, also found in Catholic contexts, but alongside them it also holds fragrant pom or copal, an incense made from the copal tree (Protium copal). Archaeologists have found that these copal trees were grown in plantation-like swaths of land expressly for the purpose of harvesting their resin. Used in numerous ceremonies, pom use dates back to the ancient Maya: censers and remains of “incense balls” have been found at multiple Maya sites and the word “pom” has been identified in hieroglyphic writing (Rhind 2013, 86). Similar post-Hispanic ceremonies using candles and copal have been recorded from Maya towns across Guatemala. While some, like the one described by Rodas et. al, are more traditionally Maya, others display more Catholic influence, while still others demonstrate a blatant merging of the two traditions. One such obviously syncretic ceremony was recorded in the contemporary Maya town of San Sebastián Huehuetenango in the 1990s. At the beginning of the festival of the patron saint, the effigy was brought outside the church and into the street. There, seven members of the saint’s cofradía worked with the head shaman of the community, each sacrificing one rooster. A sacrificial rooster’s blood was spilled into a bowl that contained candles and copal and then the mixture deposited into a fire at the feet of the patron saint, Sebastian (Deuss 2007, 29). While the use of specific candles certainly has European Catholic origins, fire had been used in Maya ceremonies long before the Spanish arrived, often signifying rebirth and renewal (Martin and Vargas 2008, 112) and continues to this day. The long history of incense use by the Maya has already been discussed, making the only “new” element of this ceremony the identification of the effigy as a Catholic saint. “If one watches the prayers on a Sunday morning when the church is crowded, one will notice [the shaman] making the sign of the cross with the pisbal kotsih above the head of his kneeling client, removing a candle from the bundle and making a cross with it above the client’s head, and lighting the candle before a saint or on the floor in the middle of the church. No doubt the pisbal kotsih and its contents are held near the worshipper’s head so that they may absorb the prayer-thoughts that fill it” (ibid.). Figure 6. Santos don finely woven miniature textiles such as this both inside churches and while on procession. Red, a sacred color to both the ancient and contemporary Maya, is the most common color for santo clothing. Michael C. Carlos Museum, 2009.42.259. Photo by Michael McKelvey, 2017. The sacred bundle cloth can also be used to carry and bless seeds for planting. Extending the idea that the cloth holds special, prayer-containing entities, the seeds inside would be imbued with the desire for them to sprout and produce the maize necessary for life. They too might be believed to absorb all of the previous prayers that the bundle had held. Seeds denote life, fertility, the ancient community, the indigenous Maya crop (not a Spanish one), so they may be assigned to the “tradition” side of the equation (Rodas et al. 1940, 132). Another connection between sacred bundles, seeds, and fertility is evident in the contemporary Tz’utujil Maya town of Santiago Atitlán. The town has long been considered a noteworthy example of a community that has retained much of its indigenous Maya ritual life. Modern practice of the bundle cult is particularly evident in the ostensibly Catholic codfradía system. The activities serve as some of the most fundamentally Maya religious endeavors, with little to no counterpart in the Catholic Church (e.g., Christenson 2016, 4; Mendelson 1958, 124). First recorded in 1958 by Michael Mendelson, the contemporary bundle cult of Santiago Atitlán remains active in at least six distinct confraternities (Carlsen 2011, 193). Though most saints, and sometimes Maya deities, have images sculpted in the round, Martín, a local deity of Santiago Atitlán has no such image. Instead, he is invoked from a cloth bundle which can only be handled by a designated shaman dedicated solely to the cult of Martín. Considered the deity “who embodies the positive, life-generating aspects of the world,” he is also the patron of the maize harvest, recalling the use of the pisbal kotsih’s use for holding seeds. Atitecos (the inhabitants of Santiago Atitlán) celebrate the Dance of Martín on November 11, which coincides with the Roman Catholic feast day for Saint Martin of Tours. Beyond the name and day, however, few connections can be drawn between the two spiritual figures. Martín is not even addressed as “Santo”, as other Catholic saints are in Maya contexts. The date falls at the end of the harvest season and the beginning of the dry season, therefore the dance is “an effort to help renew the world and give it power to bear new life” (Christenson 2001, 157-158). Although the exact ritual actions involving pom and candles are not present in this ritual, the act of bundling and concealing the sacred is very similar to the early 20th century uses of the pisbal kotsih. Rodas et al. conclude their tantalizing discussion saying “the pisbal kotsih of today…. contains objects, such as pom, candles, flowers, or seeds, which we can see with our eyes, but it also encloses invisible things, the adoration of gods and ancestors, the memories of a people whose life as individuals and as a race is a mysterious and sacred drama” (133). Despite the distance in culture, time, and religion, the authors grasped something of the fundamentals of shamanic thought and practice. 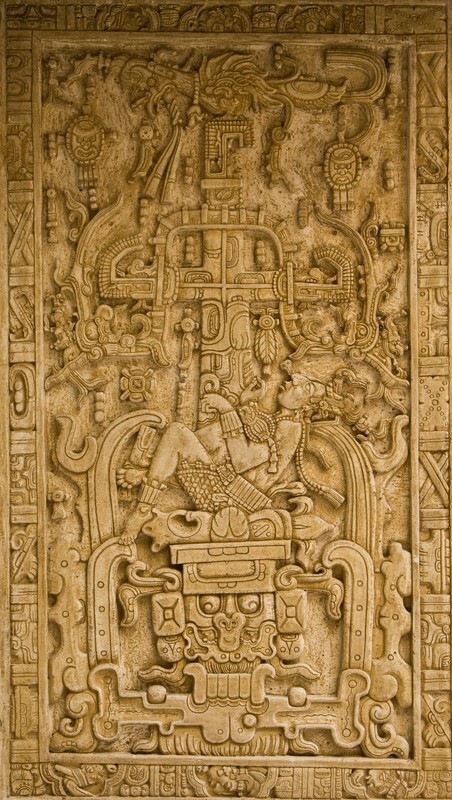 The fact that all of this ritual activity is executed with a cloth, known within the highly textile-literate Maya as to its appearance and its “subversive” uses, yet able to avoid notice by Europeans even when utilized in plain view inside a church, shows the context in which santo-related textiles must be understood. If the Maya take their bundle to the hilltop first and the church second, then so must our consideration follow that value system. Three-dimensional figures of saints were less prominent in the church decoration of the early colonial period in Guatemala than they are now. The Spanish were far less interested in producing sculpture for churches than in commissioning paintings, due in part to the higher cost of sculpture. In addition to the prohibitive cost of sculpture for fledgling churches, established indigenous sculptural programs made the friars hesitant to decorate their new churches with potentially blasphemous “idols.” Regarding these existing sculpture workshops, “inasmuch as their repertory was entirely religious, the Spaniards looked upon the native sculptors as heathen idol-makers” (Early 2006, 137). Initially wary of this indigenous carving, many “gifts” of Catholic saint effigies were sent from Spain to Guatemalan towns to decorate the churches and be used in processions on saints’ days, which were modelled on the confraternity saints’ days in Spain (fig. 5) (ibid. ; Poska 1999, 221). 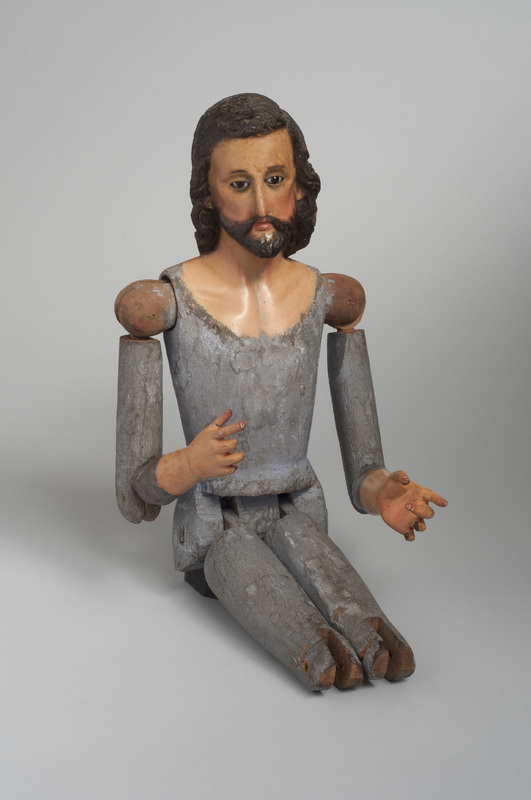 Though the first saint figures in colonial churches were sent from Spain, more and more were carved by indigenous artists over time and they became essential to the Catholic worship in Mesoamerica. Figure 8. Minute and intricate details such as braided edging and functional pockets denote the extreme care that went into constructing this santo’s jacket. Michael C. Carlos Museum, 2009.42.247. Photo by Michael McKelvey, 2017. The exhibition Threads of Time features a late 19th century santo figure (fig. 1), almost certainly representing San José (Saint Joseph), chosen by Spain to be the patron saint of the Americas in 1555. Scholars argue that the choice of Jesus’ step-father for this elevated role was a conscious decision, allowing Spain to likewise present itself as a benign “step-father” to the Native peoples in their new colonies (e.g., Villaseñor Black 2006, 13). Since the Bible only mentions Joseph eight times, and each of those only briefly, much room was left for creative, propagandistic invention of him as a benevolent patriarch. He was also favored because of his ability to intercede with his wife Mary and “son” Jesus, who was actually referred to as the “son of Joseph” once in the Bible (ibid., 21). José was the head of the Holy Family (an earthly trio nicely parallel to the Holy Trinity above) and so his authority was interpreted as analogous to that of Spanish men in their families. Spain, itself a patriarchal power under a king, echoed this symbolic structure as well. Therefore, in the logic of patriarchy, Joseph wielded authority over the actions of Mary and Jesus; he was promoted from a shadowy figure to the most powerful intercessor of all the saints. Praying to the figure of José was promoted as the best way for a colonial worshipper to have the prayers heard and answered. Hence, there are more images of Joseph than any other male saint in Guatemala, making it likely that this one is such a figure (Chorpenning 1992, 11) (however, the museum records do not indicate which town this figure came from, and many santos are similar in appearance, its identity cannot be verified absolutely). Figure 9. Although green santo clothing is less common than red, this green camisa may have been worn by a St. Joseph santo figure, as the saint’s colors are green and yellow. Michael C. Carlos Museum, 2009.42.433. Photo by Michael McKelvey, 2017. The physical features of this santo are strikingly like those used in images of Jesus, which is unsurprising since most colonial American José figures look like Jesus figures, again because of the emphasis on the family connection in the Bible (Villaseñor Black 2006, 22). This example is particularly fine and very European in style. Curly brown, shoulder-length hair and even, aquiline features make him Spanish in appearance; the Maya have straight black hair and light brown skin so he is not being interpreted as a Maya, though some of his original clothing might have been. His head and hands, which would have been visible outside the typically engulfing garments, are fully and naturalistically painted with rosy cheeks and white skin (figs. 1a, b). 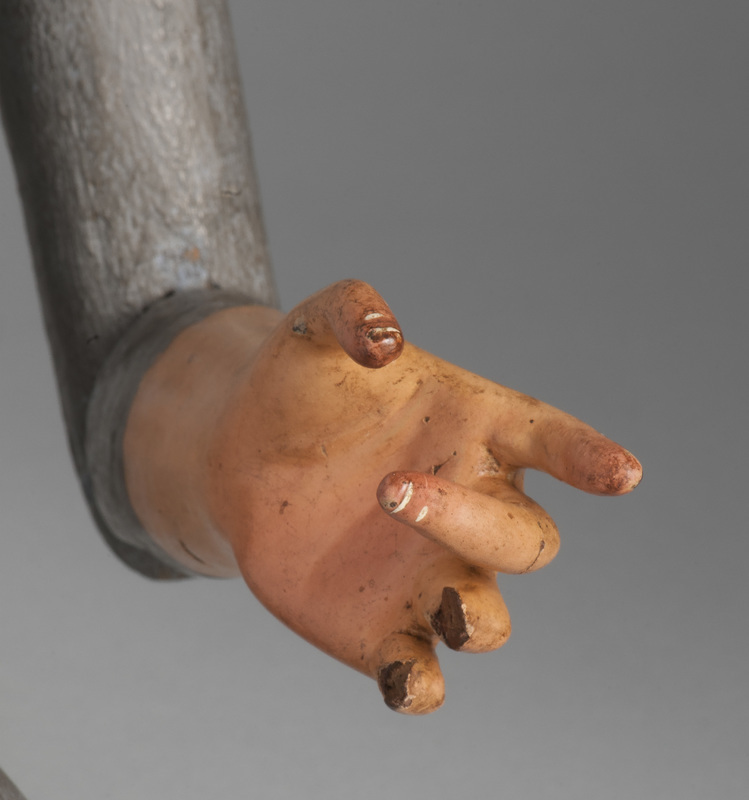 Notably, his hands are complete with white-tipped fingernails and cuticles and the palms are pinker than the backs (fig. 1b). An undersuit is painted on in blue-grey, but was always meant to be covered by a long shirt and other miniature men’s garments like those seen in figures 5 and 7-10. His head inclines benevolently and his arms can be posed in various ways (the joints are articulated and the arms above and below the elbow bevelled to hold a bent position). Again, moveable santos like this one most commonly represent St. Joseph or Jesus (Gloria Fraser Giffords 2008). His glass eyes, a primary reason to assign him a late 19th century date, seem very lifelike, almost sparkling. Indeed, the preferred European naturalistic style and the Maya audience’s expectations for three-dimensional saint images dovetailed in an odd way. The Spanish may have taken for granted that sculpted images should look as much like people as possible, nevertheless they did not confuse the two. In stark contrast, carved figures were not considered lifeless representations by the Maya worshippers, but rather as animate, living, breathing beings (Christenson 2016, 11). This understanding of the dressed saints closely resembles ancient Maya characterizations of sculpted deities as animate. Ancient Maya sculptures of both deities and rulers were “brought to life,” as it were, through the ritual actions of people, imbuing the object with a kind of animated essence. Caches of offerings at the base of stone images of ancient Maya rulers suggest that the images were not merely stone, but a living embodiment of the ruler or deity (O’Neill 2014, 59-61). To this day living manifestations of humans or deities must be cared for, involving offering food and drink and other items being presented to the figures. Through constant ritual care, the image is brought to life and is considered to be able to intercede with the divine on behalf of the Maya people (Scheper Hughes 2016, 58). Parallel actions are evident in the contemporary Maya’s treatment of santos and santas, syncretically combining ancient Maya ritual animation with the Spanish Catholic cult of the intercessory saints. Figure 10. A full-size, rather than miniature, cloth, this tzut would have been lavishly draped over a small santo, displaying the fine material and technique employed by the responsible cofradía. Michael C. Carlos Museum, 2009.42.189. Photo by Michael McKelvey, 2017. Although the Roman Catholic Church actively encouraged the cult of the saints and organized the cofradias to give indigenous converts a stake in churchly hierarchy and practice, it did not expect the sculptural image of the saint to be seen as the recipient of direct prayer, but as an intercessor between humans and God. Whereas the Church intended for prayers to be made to God via the saints, the Maya prayed directly to the image of the saint, often addressing the saint in their local Mayan language (Kakchiquel in Sololá, K’iche’ in Chichicastenango, etc.). They still do, as any observant visitor knows. 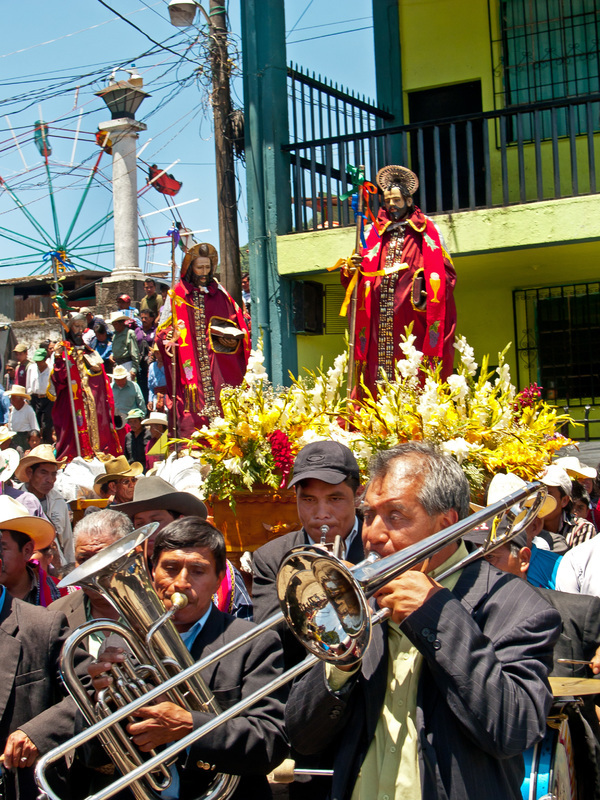 Celebrations and processions of the figure of the saint, theoretically similar to such processions in Spain, clearly involved indigenous Maya elements as well. Anthropologist Sandra Orellana describes the continuation of Maya religious practices within the cofradía sphere: “Fasting, ritual purification, abstinence from sexual relations, burning incense, drinking, and dancing characterized aboriginal general celebrations as well as those of Colonial cofradías” (Christenson 2016, 154). The use of incense was shared in shamanism and Catholicism, yet the particular type of incense burned (pom or copal) has remained a local tradition over the millennia (oddly enough, its smoke smells very much like the frankincense favored by the Europeans). However, the other indigenous ritual actions involved in a Maya saint’s feast day — fasting, drinking, and dancing — were not prescribed, nor were they much appreciated, by the friars. Significantly, purification of the participants would take place in sacred spaces outside the church, such as a sacred spring or waterfall. It could be argued that nature and her spirits were the true deities being worshipped by Maya Catholics. Perhaps the most visible manifestation of the “Mayanization” of saint figures is the way in which they are dressed and re-dressed in miniature but extravagant versions of local dress, some fully Maya (the wide fajas or belts [fig. 11] and huipiles [fig. 12]) and some partially Hispanicized (the sleeved shirts and jackets; figs. 6, 8, 9) (Altman 1992, 31). In these ways a “Catholic” worshipper, holding a conversation in their native tongue while admiring and taking pride in the saint’s fine clothing, was interacting on Maya terms with a small but powerful version of him or herself. Saint figures are quite literally folded into Maya culture, almost entirely on their terms. Figure 11. Jaspé, or tie-dyed, stripes on this faja signify the status of both the santo and its associated confraternity members. Michael C. Carlos Museum, 2009.42.432. Photo by Michael McKelvey, 2017. As among the colonial and modern people, a santo’s clothing is more Europeanized than is a santa’s attire. The mirroring of living people and wooden figures was clear; men dress in a more hybrid way with tailored jackets and pants, but women, whether flesh or wood, wore more traditional clothing (see Creations of the Red Goddess). As an aside, in traditional indigenous thought a piece of wood was alive: trees are living beings that are addressed and thanked for giving their bodies for firewood, sculptures, and other uses. The wood from which the body of this piece, like many, is cedar (Meliaceae cedrela) (Alexander Wiedenhoft of the Forestry Service of the United States Department of Agriculture, personal communication to Renée A. Stein). As mentioned at the outset, among the Maya, as with many world peoples, from ancient times onward, the Cosmic or World Tree has been a symbol of the living universe, with its roots in the Underworld, its trunk in this realm, and its branches in the celestial one. The tree can be seen erupting from the body of the Maya king Pakal on the stone lid of his sarcophagus, denoting his rebirth after death (fig. 7). Therefore, the dichotomy that the Spanish friars established, and Western culture tends to perpetuate, may have made between a “real” person in the flesh and an “image” in wood does not necessarily apply to the Maya mindset. The tiny but faithfully reproduced saint’s clothing featured in Threads of Time includes for a santo: two camisas or shirts (figs. 6, 9), a jacket (fig. 8), a cape, a tzut or headcloth (fig. 10), and a faja or belt (fig. 11). One garment, a huipíl (wide shirt), for a female saint is included as well (fig. 12), simply because the collection only holds that one example. It is, however, of much finer quality than any of the other representative items for a santo. The miniature red jacket, measuring only 6 inches tall and 17 inches wide, with sleeves extended, is perhaps most striking of these santo clothes (fig. 8). A minute green braid has been embroidered onto the edges of the cotton jacket. 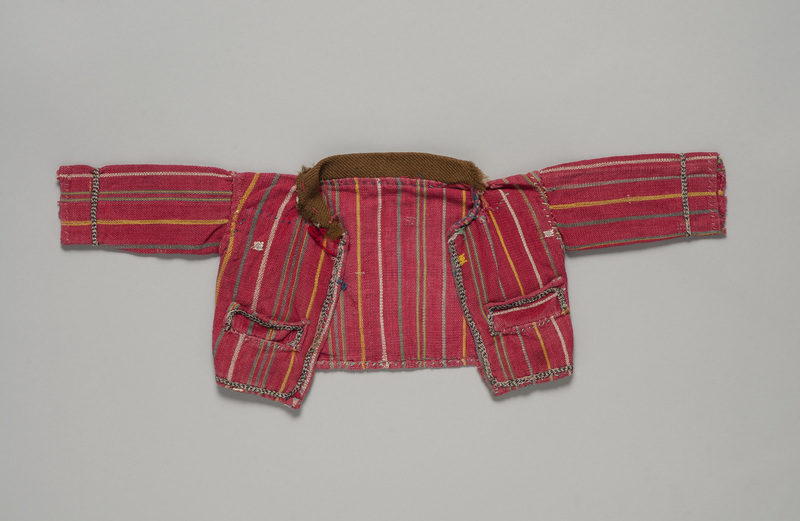 In Sololá in particular, men’s full-size jackets often include a solid or two-tone braided edging, pockets, and a striped pattern, which were certainly not present in the conventional Spanish man’s jacket (Altman and West 1992, 39). The braided edge around the jacket is known as murciélago (bat), and is considered local, not Spanish, design. Bats, because they live in caves which are considered entrances to the Underworld, were considered sacred by the ancient Maya (Benson 1998, 102). 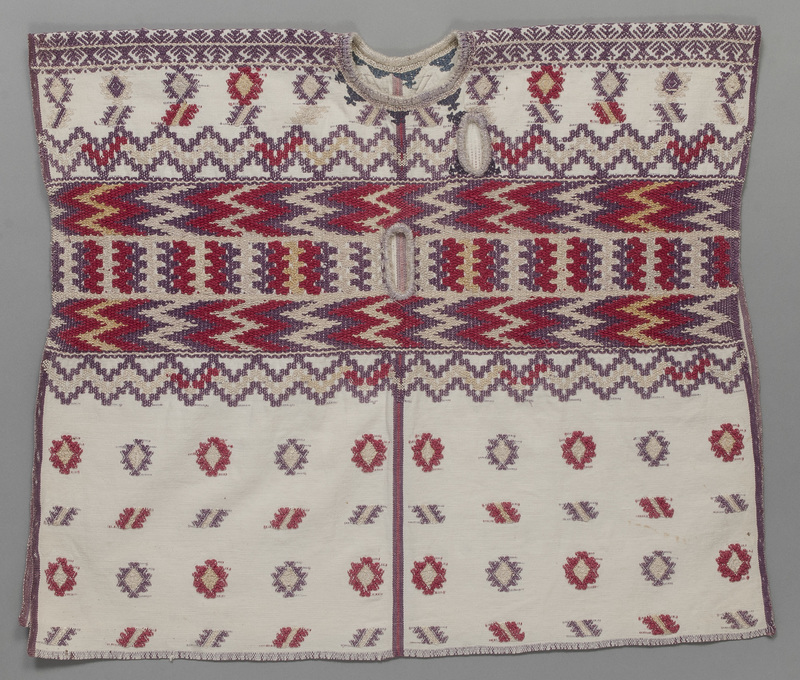 It is unsurprising that bat imagery persists in textiles from Sololá, which is a Kakchichel Maya city. The title of the Kakchicel cacique meant “Lord of the People of the Bat” (ibid., 105-106) and numerous Kakchicel textiles continue to include bat imagery. The sacred nature of the wearer of the little jacket is evident in the great amount of care that went into creating it. In terms of tailoring, which was a wholly Spanish introduction, sleeves, a collar, and cuffs and even functioning jacket pockets have been incorporated. Obviously the pockets would not have been used, but that level of detail shows respect, the time taken, and is a nod to the European origin of the saint that wears the jacket. Traditional Maya men carry bags instead of having pockets, as is true among many Native Americans (e.g. Schevill 1993, 217; Rees 2004, 143; Meisch 2012, 87; see Bolivian ch’uspas). Figure 12. Two holes in this santa huipíl suggest that it may have belonged to a representation of the Virgin Mary, allowing her to be posed breastfeeding the baby Jesus. Michael C. Carlos Museum, 2009.42.180. Photo by Michael McKelvey, 2017. The shirts (camisas) with sleeves and a collar were also brought by the Spanish and adopted by indigenous men. A shirt like the small green one (fig. 9) may very well have been worn by the wooden santo. Importantly, green and gold are the colors assigned to Joseph by the Catholic Church. In ancient Maya thought, gold was one of the colors closely associated with maize and green specifically with young maize, representing the various gods of the young, mature, and harvested stages (Brennan 1998, 75). Green santo clothing is somewhat rare, with most of the miniature clothing being red (fig. 6), the high-status color long associated with Maya creator gods, the sun, blood, and beginnings (Moore 1999, 79). 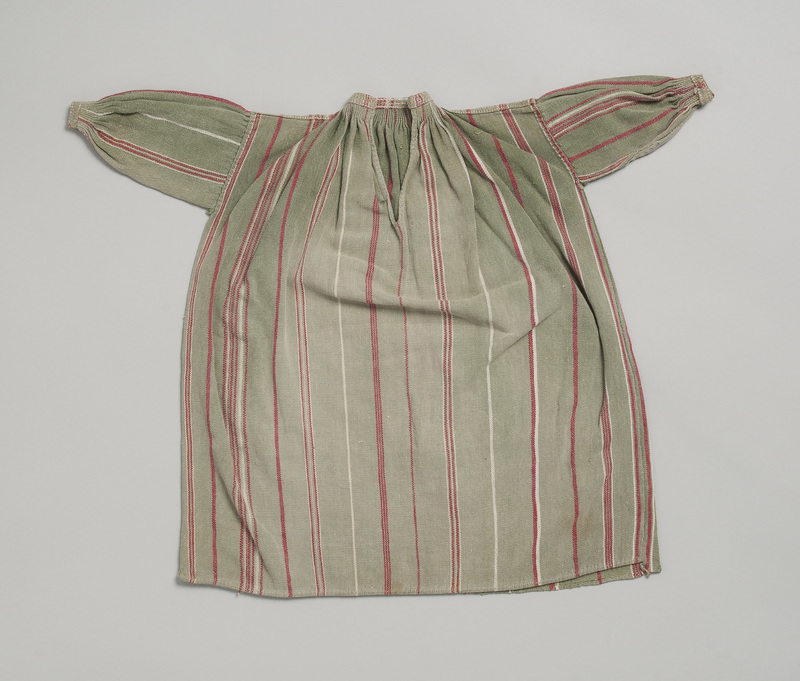 However, red appears in some of the green shirt’s stripes, like a Maya commentary on what colors they deemed most appropriate for divine figures (recall that santos are dressed in new clothing over and over during their lifetimes so not all of this Joseph’s many shirts would be late 19th century in date; this green example actually dates to the early twentieth century. Like the red shirt (fig. 6) and indeed santo clothing as a whole, the green shirt shows little signs of wear. Santos rarely, if ever, wore deteriorating textiles since faded or ripped clothing would be considered insulting to the saint and humiliating to the cofradía responsible for him or her). In terms of finery, the santo tzut (fig. 10) — meaning an all-purpose cloth often folded on a man’s head to be ready for whatever needs arise — is a very prestigious and unusual piece. Measuring 39 ½ by 36 ½ inches, this tzut is very large, differing from the diminutive size of the rest of the ensemble, but expressing the status of its santo by requiring copious materials and time for manufacture. It may have draped over the head of the figure and its rich and colorful folds spread over the altar in an impressive display. Being full-sized, it is more analogous to an actual man’s tzut, following the Maya mandate to make saints and people equivalent in many ways. It, too, features Joseph’s green color, along with another high-status color, blue. The silky material is likewise sumptuous and very rare. Silk has been imported to the Americas via the Spanish since the 16th century and has held pride of place in the hierarchy of non-indigenous fibers ever since (this Asian luxury material is also found in Peruvian colonial textiles, such as a woven cushion cover with a detailed European-style coat of arms [Stone-Miller 1994, 189-190]). The incorporation of this extravagant thread displays wealth and power of the owner to the onlooker. Other clearly European elements are the bands of sewn-on lace, which were not likely to have been made locally in Guatemala but rather imported from overseas. Though this is a very hybrid Maya cloth, it nevertheless pays homage to its santo in the terms of both the local and Spanish-influenced culture that resulted when the two worlds interlace. Certain male saint figures wear the wide belts known as fajas, which represent a purely “traditional” aspect of indigenous dress (fig. 11). Woven with stripes and wound around the waist, fajas can be plain or elaborate. This miniature one is more impressive than first glance might indicate. The blue and white stripes, changing from one color to another, are made from tie-dyed threads (ikat to most textile specialists, jaspé in Spanish). Though the pattern is not complicated, the use of these pre-dyed threads is a more elevated technique than a simple white or blue stripe. In addition, the use of indigo as a dye — the notoriously rare and difficult colorant and one that has high value as a result — further distinguishes the stripes from the everyday. To lavish blue tie-dye on this little belt is another prestige statement meant to honor the divinity as a high-status Maya man and express the status of the responsible cofradía. Finally, the most traditional of the miniature garments is the huipíl made for a santa (fig. 12). Like the full-sized ones shown in in Threads of Time (see Creations of the Red Goddess) and characteristic of Maya women from antiquity to the present (see The Ties that Bind), tiny ones are rectangular and heavily brocaded. Weaving any small garment is considerably more difficult than a full-size one, but a very talented Maya woman spent a great deal of time on elaborate patterning in purple and pink as well. Requiring great manual dexterity, since its span does not leave much room for fingers, such a diminutive blouse stands out from the rest. The artist intentionally left two holes in the front, carefully embroidering their edges so they would not unravel. These openings may well indicate, or at least suggest, the “saint” that wore this particular huipíl. The Mother Mary often is shown nursing Jesus: one hole could have been for her arm and one for her breast. Traditional Maya women breast feed (the loose fit and wide armholes of the full-size huipíl are, in fact, designed to facilitate this action). By dressing Mary like a Maya mother, the indigenous people reinforce their ideal female role as fertile, nurturing, responsible, and skillful. It is interesting to note that in many colonial paintings from nearby Mexico, Mary is depicted spinning or weaving, again reflecting how indigenous values can be expressed in the midst of Spanish religious demands. Syncretism between the ritual and belief systems of the Highland Maya and Catholicism is clearly evident in the cofradía context, especially the santo clothing ensemble, as well as in the continuation of aspects of ancient Maya bundle cults. Both the sacred shamanic cloth and santo/a clothing represent the belief that all is alive, so central to the ancient Maya worldview and and persistent in syncretic Catholic and indigenous ritual to this day. The cloths hold power, as do the charged offerings they hold inside, and the saint effigy is much more alive than just an “image.” By instilling color, detail, and life into the tiny finery of the santo, a particularly indigenous version of beauty, appropriateness, and status was infused into the act of dressing the saints. By maintaining those parallel but elevated beings’ lives through ritual activity, the Maya simultaneously reinvigorate ancient traditions and uphold Catholic values. The devoted members of the cofradía carry on this fascinating religious fusion through the long-treasured and highly expressive medium of cloth.